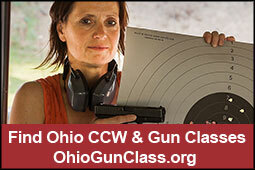 On Monday, September 20, 2010, we received the sad news that the Ft. St. Clair gun club in Eaton, Ohio is closing. While we lament the loss of another range, we were touched that one of their final acts was to give a generous donation of $2,500 to Buckeye Firearms Foundation, a 501(c)(3) corporation dedicated to defending your firearm rights. At almost the same time, we received word of a truly horrifying abuse of police power that occurred in Wisconsin over the weekend. Five members of Wisconsin Carry Inc., a state firearms rights group in Wisconsin, were legally open carrying in their local Culvers restaurant when a dreaded "man with a gun" call was made to the local police. Listening to the 911 call, it is 100% clear that the police knew these five citizens were not violating any laws. Listen to the 911 tape yourself. No threat. No panic. 911 dispatcher says "it is legal." No one threatened or worried. This, unfortunately, did not prevent the Madison police department from overreacting by sending eight officers to Culvers to harass the law abiding citizens. Realizing their mistake, Madison dismissed the two original charges filed, and instead charged all five citizens with bogus charges of disorderly conduct designed to intimidate the citizens. Listening to the 911 call and the audio tapes of the encounter, it is evident that the police engaged in a gross abuse of power. Compounding this abuse of power, the Madison police department has announced that anyone openly carrying a firearm in Madison can expect the same treatment. From the police chief, "Chief Wray wants to make clear: It is the department's wish that concerned citizens call 911 when they see armed subjects." So why should Buckeyes care about civil rights abuses in Wisconsin? First, this case has clear federal lawsuit implications, meaning the precedent from Wisconsin can directly affect Buckeyes who choose to open carry. While Ohio has not experienced this degree of police-state abuse, we all know that open carry in Ohio is still not fully accepted by police even though it is legal. Second, Wisconsin is one of two states without a concealed carry license. The only way to exercise Second Amendment rights in Wisconsin is open carry. If you have been following concealed carry news over the past few years, you know the value of vibrant open carry in pressuring a state to adopt a "shall issue" concealed carry license. I was fortunate enough to have visited with "Buster" Bachhuber, a NRA Board Of Directors member from Wisconsin, several weekends ago. He fully believes that Wisconsin will become the 49th state with CCW in the next year. This also means that Buckeyes may soon gain a new state where they may carry as they travel throughout this great land. Third, what better legacy for Ft. St. Clair to leave? Their generous donation can impact the rights of gun owners "behind the iron curtain" in Wisconsin and help thousands of gun owners nationwide. We have earmarked Ft. St. Clair's $2,500 gift to be used as a matching donation fund. For every dollar that you donate to help the Wisconsin five, Buckeye Firearms Foundation will match that dollar, up to $2,500. This will help us raise a total of $5,000 to help the Wisconsin five pay for legal fees to fight the charges against them. It is also entirely likely that Wisconsin Carry will be awarded attorney fees as a result of this abuse, meaning Ft. St. Clair's donation will be returned to us and used for future gun rights lawsuits. It is truly the gift that keeps giving. Buckeye Firearms Foundation has agreed to accept direct donations on behalf of Wisconsin Carry Inc. so that our tax deductible status can be leveraged to help out gun owners in Wisconsin. Every donation received will be 100% donated by Buckeye Firearms Foundation to Wisconsin Carry Inc., so that donors get the tax deduction to fund this worthy cause. Between the tax deduction and our matching contribution, you will never get more "bang for your buck" in supporting gun rights. We urge you, for the sake of the innocent Wisconsin five, and the sake of law-abiding gun owners all over America, to make a generous donation today.